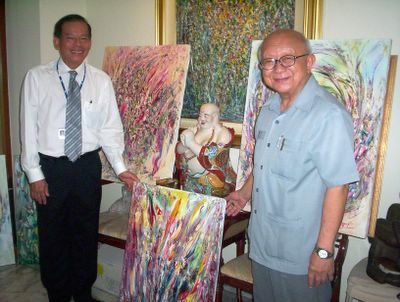 Khun Kamchorn Sathirakul, Chairman of the TISCO Foundation, presents Khun Pliu Mangkornkanok, CEO of TISCO, nine of his paintings on the occasion that TISCO will become TISCO BANK. Prior to becoming Chairman of TISCO Foundation, Khun Kamchorn was Governor of the Bank of Thailand. He has also become an active painter and many of his paintings adorn various corporate offices and private residences.